Almost every big dynamic website requires a backend to manage the data. If you are using a framework, it could be simple task. But creating it from scratch can requires a lot of effort because there are lots of things to build. Building admin panel is not easy from code, but giving it a perfect and user friendly design is always hard. If you are not a designer but want a good design for your admin panel, you are at the right place. In this post, we are adding few free admin templates that you can use to give your backend a better look. All these templates are available for free. You can download any of these and start using on your web projects. Adminator is one of my favourite admin template with lots of page templates and options. It is available for free of cost and you can use it even in commercial applications. Ace is another good admin panel template with full management options for the site’s UI and UX elements. It comes with lots of components that you might need in your dashboard. It is built on Bootstrap 3 and all code is available to download on an open GitHub repository. Charisma is a nice admin panel template that comes with many UI elements and plugins. It works on all modern browsers. Design is responsive. It is open source and comes for free. 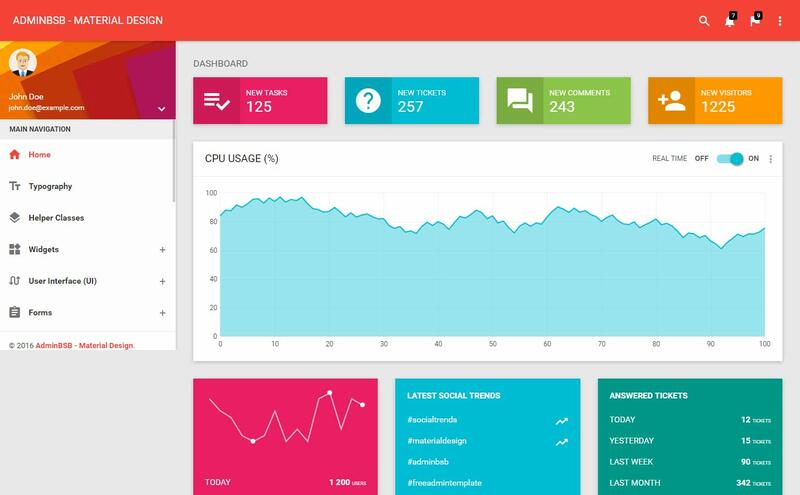 Flat Admin V2 is also a responsive admin dashboard template based on flat design. It comes with good user interface and lots of built-in elements to choose from. It has pricing table, charts, cards, forms, tables and more. Matrix is a light weight, easy to customise and easy to use admin panel template built on Bootstrap. It comes with lots of components and design elements to work with. You will surely like its user experience. It has over 20 professional quality plugins for offering several functions. Free Bootstrap Admin Theme is built with Twitter Bootstrap. It is responsive and comes with so many nice components like navigation, tables, forms and error pages and many other pages which you would need while creating the admin panels. Startmin is also a notable admin panel template built on Bootstrap. It is responsive and works perfect on mobile devices. It comes with charts, forms, grids, pricing table and more. So, it is perfect for any kind of dashboard. Colored is a flat responsive web template for admin panels. It has lots of features and is suitable for Dashboards, Project management systems, CMS, CRM and more. It is built on HTML5, CSS3 and jQuery. AdminBSB – Material Design uses Bootstrap 3 and Google Material Design. It is a colourful admin panel template with charts, forms, typography, widgets and more. Gretong is also a good admin panel template to try. It has Minimalistic and simple Metro styled design. The template us built using HTML5, CSS3 and Bootstrap framework. It is cross browser supportive and Responsive. CoreUI is built on Bootstrap 4. It has versions: HTML5, AJAX, AngularJS, Angular 2, React.js and Vue.js. You can start with any you are comfortable with. Lumino is also a free to download admin dashboard template built using latest Bootstrap standards. It comes with Tables, Forms, Charts, and Widgets capabilities. It is fully responsive and beautiful. Light Bootstrap Dashboard is a light weight free admin dashboard built using bootstrap. Spring-Time is another nice Admin panel template you can get for free. It also comes with various design elements and plugins. You can use this to create a simple and clean admin panel. BlueWhale Admin Template is a 960 Grid Framework that uses jQuery + jQuery UI. It has all kind of pages like dashboard, forms, tables, typography, charts and many other. HTML5 Admin Template is also very good template. It comes with graphs, forms and many other dashboard templates. It also has few components and plugins.